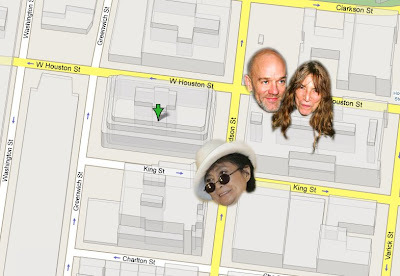 As I was leaving work one night in December, I ran into Michael Stipe and Patti Smith on their way to an event happening in my building. As if that wasn't cool or random enough, I now have a new musical sighting by the Saatchi building. Last Monday I stepped out to get some fruit around 3pm. Just as soon as I left the building heading down Hudson Street--there she was. Yoko Ono. With her was a younger woman wearing a matching hat and a few other men who I assume were her bodyguards. Because there were so many others, I didn't think it appropriate to stop them all. I did, however, flash her a big smile which she returned to me. So I don't know who is putting these rock heroes in my path, but whoever you are, could you please send Wayne Coyne next? Thanks.